My blog’s been pretty quiet recently as it’s been business as usual – driving up and down the M6 to Manchester and back for my Nivolumab treatment. Although, that’s not to say nothing interesting has happened: Nivolumab got itself some nationwide coverage, as did the Christie in a BBC documentary. And I realised I was addicted to painkiller tramadol, before withdrawing from it with interesting effects, to say the least. And finally, and most importantly of all for me, I had my latest CT scan. 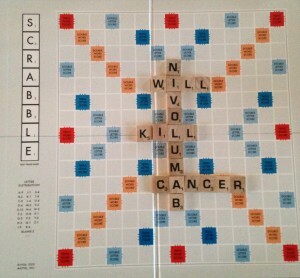 Nivolumab: It’s a long and complicated word that will only score you 16 points in a game of Scrabble. So with that in mind, I went into last Tuesday’s scan with pretty low hopes. I just prayed there were no new nodules and that the ones already there were stable. Thanks to the simply brilliant thing that is The Christie, we were able to get our results – or a flavour of them at least – on the same day as my scan. Formal scan reports aren’t usually ready for at least a week but my docs were happy to look at the scan with their own eyes and tell me what they saw. The results shocked us all. I was sat in a fancy treatment chair having my one-hour Nivolumab infusion when I was given the news. One of my doctors came up to the centre with a laptop that had my scan pictures on it. As the doc ran through them, I couldn’t believe my eyes. The big 4cm tumour in my remaining adrenal gland – the one the top professor had described as having the “fastest growth he had ever seen” just three months ago – had shrunk by more than half. It was now 2cm x 1.5cm. Incredible. The other tumours – in my lung, neck and chest – were hardly visible. The scan pictures are quite hard to understand for amateurs like me but when the doc compared them with my previous scan, the improvement was obvious. We estimated that they too had shrunk by about half. Plus, they couldn’t spot any new nodules elsewhere in the body. After being told to expect stability rather than progress, we couldn’t believe our luck. Remember, I have had just EIGHT cycles of Nivolumab and experienced virtually no side effects, yet have seen massive improvements in that time. This is the future of cancer treatment, right here. However, as is seemingly always the way, it wasn’t quite a 100 per cent victory. The tumours in my bones had obviously been harder to reach. My spinal tumour looked ‘different’ and to be fair, it is still causing me pain so I knew to expect as much. The radiotherapy had worked well there but it appears the tumour is growing again and with it being in such a sensitive area, the future is unclear on how to treat it. 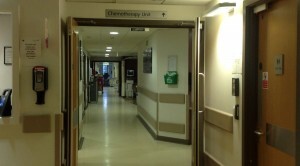 The Christie’s Chemotherapy Treatment Day Centre, where I get my Nivolumab fix. But it was a nodule on my pelvis that probably caused the most discussion. On the previous scan it had been spotted on my left side but was very small. But that wasn’t the case now. It had grown, despite the Nivolumab, and was very close to fracturing my pelvis. Again, like the spine, this wasn’t a surprise to me. A swollen lymph node appeared in my groin area a few weeks ago and at times I have had to limp because of pain at the top of my leg. Next week I will have to stay up in Manchester for a week and have around five radiotherapy sessions in my pelvis area. I might also end up having injections and calcium tablets in the long run to help strengthen my bones. With all that in mind, I think this is a good time to again say a massive thank you to everyone who raised cash for us through Ajax to Ajax, fundraising gigs or other means. It was exactly this type of scenario that worried us before but doesn’t now. So thank you X. Anyway, forget the negatives for a moment. There were too many positives in those scan pictures to feel anything but joy. There have been too many dark moments in the last 18 months to worry about those two rogue tumours. After the meeting with the doc we didn’t celebrate wildly or go mad, we just had a little cry to ourselves and said ‘thank you’. There is still a very, very long way to go and we’re very, very aware of that! Cancer cells can adapt and just because this batch has worked, there are no guarantees. Having said that, we’re having this moment. It’s mine – it’s Gemma’s and my family’s – and it’s everyone else’s who has supported us with their love, cash, time and good wishes. It’s certainly been our best month in a while, even if that hasn’t been the case for the rest of the world. The death of Muhammad Ali has been one of the many sad events to have taken place in June. I took solace from one of his famous quotes – although whether he or some marketing geeks at Adidas came up with it is another story! I actually began the month not only clueless as to the treatment’s effect but also mourning the loss of a hero. 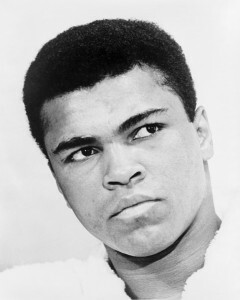 Just three days into June, it was announced that the great Muhammad Ali had passed away. I’m not even that big a fan of boxing but, like everyone, I was gutted. I’ve watched his fights and read about them but it was his ability to turn a phrase that made him really stand out. His quotes are legendary, and in early 2014 I purchased a framed copy of one of them. I was at a charity ball for the amazing 353 organisation and was ridiculously drunk off lager and red wine. So, naturally, I decided to get involved in the silent auction. I stumbled across the picture after looking for items that had taken no bids, before writing down a figure above £100. I fully expected at least one person to out-bid me. But they didn’t – so it was mine. I didn’t really know what to do with it at first. I was chuffed with the purchase but it was big and I had nowhere to put it, so I decided to put it away until Gemma and I got our own place – then I’d put it up somewhere nice. Muhammad, you were damn right. This entry was posted in All My Blogs, Blogs About Cancer and tagged in Blog, Cancer, cancer blog, Health, Immunotherapy, Kidney Cancer, Nivolumab.